Whether your data is stored in a spreadsheet, on your phone, or in an email program, here’s how to import the data to your app. For example, you might want to import your customer contact list from an Excel spreadsheet into the app so you can keep track of all your customer information in one place. 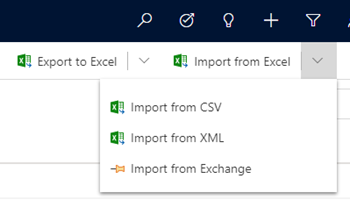 Export your data into a comma-separated values file (.csv). Save the file in a location where you can easily find it later. If necessary, edit any column name in the spreadsheet to exactly match the corresponding name shown here. If the spreadsheet doesn’t include all the column names listed, that’s OK. However, if a column name does exist, it must match exactly with the corresponding name in the list or the import won’t work. Spaces are required. Note that the word “Email” doesn’t contain a hyphen. Use a USB cable or an app to export your data such as contacts from your phone to your computer. On the command bar, select Import from Excel or Import from CSV. Browse to the folder where you saved the file that contains the export of your contacts. Select the file, select Open, and then select Next. You can import only one file at a time. To bring in more files, run the wizard again later. Review the file name and verify that the field and data delimiters are correct using the Review Mapping option. If everything looks good, select Finish Import. After the wizard finishes, check your data (for example, list of contacts) to make sure they imported correctly. From the main menu, go to Contacts. If you are importing data that includes double-byte characters for east asian languages, make sure the file is encoded as UTF-8 BOM. Plain UTF-8 may not be enough. Open the CSV file using Visual Studio Code. In the bottom bar, click the label UTF-8 (pop-up opens). You can now pick UTF-8 BOM encoding for that file.